The 2018 CIBC Canada Russia Series has thus far seen Team WHL and Team Russia split a pair of closely-checked, low scoring encounters where key third period goals made the difference and strong goaltending factored into the final result. 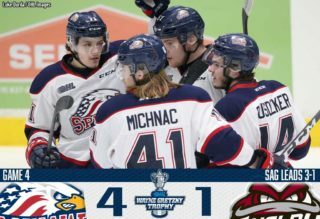 Monday’s Game 1 saw the Lethbridge Hurricanes duo of 2019 NHL Draft prospect Dylan Cozens and veteran captain Jordy Bellerive score goals, with the latter netting the game winner midway through the third period in a 2-1 WHL victory. A night later Russia exacted revenge with a 3-1 win, connecting on a late third period power play as Stepan Starkov scored the deciding goal with less than two minutes to spare in regulation. Here’s another look at the #OHL stars who will compete Nov 8 & 12 in the @CIBC #CANvsRUS Series. Team OHL head coaches Derian Hatcher (Sarnia Sting) and Greg Walters (Oshawa Generals) take over behind the bench for Games 3 and 4 set for Thursday night in Sarnia and Monday in Oshawa. 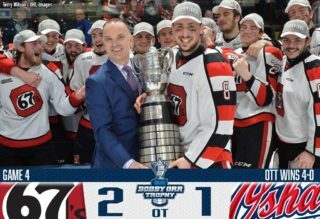 This marks the third straight year that the OHL inherits a tied series and the sixth time in the history of the event that the scenario has arisen. Team OHL has split decisions with Russia in each of the past two years but the CHL ultimately went on to take the series both times. Of note, both Owen Tippett (Mississauga Steelheads) and Markus Phillips (Owen Sound Attack) will play in both games as they embark on their third CIBC Canada Russia Series together. 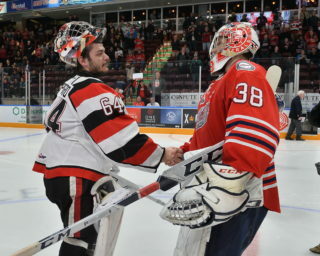 Team OHL will be headlined by Vancouver Canucks goaltending prospect Michael DiPietro (Windsor Spitfires) who will be in the lineup on Thursday night in Sarnia along with first round NHL Draft picks in Tippett (Florida Panthers), Barrett Hayton (Soo Greyhounds/Arizona Coyotes), Morgan Frost (Soo Greyhounds/Philadelphia Flyers), Nick Suzuki (Owen Sound Attack/Montreal Canadiens), Liam Foudy (London Knights/Columbus Blue Jackets) and defencemen Evan Bouchard (London Knights/Edmonton Oilers) and Ryan Merkley (Guelph Storm/San Jose Sharks). Ready to represent Russia ?? Maksimov, Lipanov, Prosvetov, Toropchenko, Samorukov to compete against #OHL in 2018 @CIBC #CANvsRUS Series. 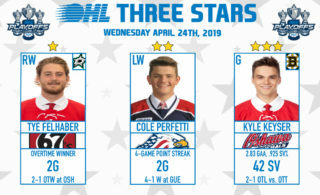 While the OHL will have fresh legs ahead of weekend action Thursday night, there’s also good news for Valery Bragin’s Russian squad as reinforcements in NHL prospects Kirill Maksimov (Niagara IceDogs/Edmonton Oilers), Alexey Toropchenko (Guelph Storm/St. Louis Blues), Alexey Lipanov (Kitchener Rangers/Tampa Bay Lightning), goaltender Ivan Prosvetov (Saginaw Spirit/Arizona Coyotes) and World Junior returnee Dmitri Samorukov (Guelph Storm/Edmonton Oilers) will slot into the lineup. Sarnia will host Thursday’s game for a CHL record-tying fourth time, following events in 2003, 2006 and 2012 before Oshawa hosts its third game after previous contests in 2006 and 2013. Games 3 and 4 of the 2018 CIBC Canada Russia Series get underway at 7ET/4PT and will be aired live on Sportsnet while also streaming online at CHLLive.com.